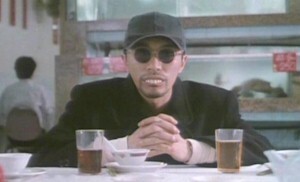 The Skinny: One of the most trying Stephen Chow experiences arounds. A hilarious, but also bloody and relentless assault on your funnybone. Unpopular in Hong Kong, but not without fans in America. This film from Jeff Lau, master (?) of crazy comedy, finds Stephen Chow as a mental patient/ghostbuster who dresses like Leon from The Professional and talks to his plant. Here’s the scoop: when a Hong Kong highrise is haunted by the ghost of someone’s grandma, Chow gets involved by teaching the security force how to fight ghouls from the beyond. Karen Mok plays his love interest and greatest fan, and she skews both her character in Fallen Angels AND Natalie Portman’s from The Professional. This movie is wacked out beyond all belief, throwing jokes at you from every possible angle. As you'd expect from a Stephen Chow/Jeff Lau collaboration, there's enough toilet humor, movie parodies and general silliness to go around. Jeff Lau relentlessly assaults our funny bones, taxing them to near exhaustion with so much nonsensical silliness that it threatens to be criminal. The effect can be fun, but also tiring and even obnoxious and annoying.